The fact that I’ll never get to experience ‘Annihilation’ in the cinema breaks my heart. 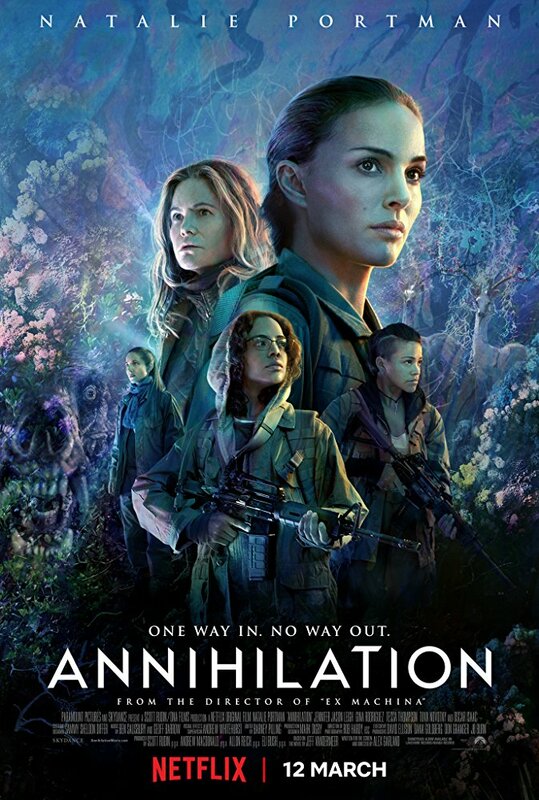 ‘Annihilation’, starring Natalie Portman, Jennifer Jason Leigh, Tessa Thompson, Gina Rodriguez, Tuva Novotny and Oscar Issac, is the latest sci-fi gem to come from director/writer Alex Garland. It follows five scientists who set out on a dangerous expedition into a mysterious area known as ‘The Shimmer.” A place where the laws of nature don’t apply. Before I start my review, I have to talk about the whole Netflix issue with this movie. I was sad when I heard that ‘Annihilation’ wasn’t going to get a theatrical release over here in Australia. A majority of the reviews leading up to its Netflix release praised the visual appeal of it and how it is essential to see it on the big screen. Watching it on a laptop wasn’t the best way to experience it for the first time but it was the only way I could watch it. So, even with Americans telling everyone to watch it on the big screen, us Australians can’t and have to settle for it on Netflix. I’m not saying it makes the movie bad but it would have been amazing to see it in a cinema. Now, onto the review. First of all, ‘Annihilation’ is a stunning movie. Cinematographer Rob Hardy has done a fantastic job with what is already the best looking movie of 2018 (‘The Shape of Water’ is technically from 2017). From the breathtaking colour palate used to create the shimmer, to the fantastically composed shots, Rob Hardy has done an incredible job. He has managed to up himself from ‘Ex Machina’ which is a huge compliment. This also leads me to the direction from Alex Garland, which is amazing. Alex Garland has managed to adapt a trilogy of strange sci-fi novels into one standalone movie, which is not easy to do (I mean, look at Peter Jackson adapting ‘The Hobbit’ into a trilogy. That’s just stretching it). I’ll talk about how accurate it is later but the directing is just superb. You can also see some inspirations from other sci-fi movies here as well. For example, there is a 10-15 minute sequence near the end of the movie which really reminded me of ‘2001: A Space Odessey’ due to how it just used music and visual storytelling to explain a major part of the story and it’s just brilliant. Alex Garland also did an amazing job with the screenplay. Like I mentioned before, he has adapted the first part of a trilogy but made it so there is no need for sequels. It sounds weird but I like how he doesn’t want to make it a trilogy like its source material. He made a standalone movie that tells a complete story and it’s very refreshing to see in a world where movies set up entire universes and sequels. The writing is smart and challenging for the average audience. I can already tell a lot of people won’t like it due to the challenging nature of it and the questions it makes you ask as you watch it. You must pay attention when watching ‘Annihilation’ to get the most out of it. This is one of the only movies to come out over the last few years that has made me not want to look at my phone. This is a compliment to the writing from Alex Garland and it’s simply brilliant. The performances are all amazing. It’s a cast made up of mostly females which is also very refreshing to see. Natalie Portman is terrific in what is easily the best lead performance this year (so far). She gave an emotional, yet also hardened performance which is always great when done well. Natalie continues to prove that she is one of the best working actresses today and here she is at her best. Her character is also fascinating as you find out her dark secrets over the course of the movie, which is great. Jennifer Jason Leigh is as great as always as the “leader” of the expedition. I feel like she never gives a bad performance and ‘Annihilation’ proves that she is severely underrated as an actress. Tessa Thompson was also amazing, as was Gina Rodriguez and Tuva Novotny. All three of them were supporting characters to Natalie Portman and Jennifer Jason Leigh, but they were just as interesting and well developed. Each of them goes through a lot throughout the movie and I must commend them for giving great performances. Last but not least, Oscar Issac was terrific. Although he was only in about four or five scenes, he managed to show how great of an actor he really is and why he should be recognised more for his work. Seriously, he is amazing. The music was a great mixture of genres. Well considering this is a sci-fi/horror movie, the music had to go in that direction and it’s amazing. At one point it gave me ‘Blade Runner’ feels and it sent chills down my spine. It’s a great score that suits the movie perfectly. Overall, ‘Annihilation’ is an intelligent sci-fi movie that demands your attention due to the challenging nature of it. It may be too weird for a mainstream audience, but if you give it a chance I guarantee that you won’t be disappointed. Although it is a shame that I (and most likely you) will never get to experience it on the big screen, this is still a phenomenal sci-fi movie that stands out as one of the best of the decade.